Maraschino cherries are some of the most beloved treats in the world, and now you can indulge in the delicious flavors of Maraschino cherries and rich, luxurious white chocolate undertones � together. This White Chocolate Covered Cherries flavored coffee has a smooth and silky white chocolate creaminess in each and every sip that is blended with the sweet ripened flavor of cherries. 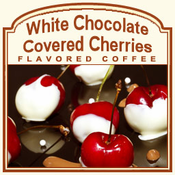 Delicious and tangy, the White Chocolate Covered Cherries coffee only has 2 calories in each cup � so you can indulge in this chocolate-infused, fruity treat any time. Made with 100% authentic Arabica beans, this dessert-inspired White Chocolate Covered Cherries coffee has a royal gourmet taste. Roasted and shipped on the same day, the White Chocolate Covered Cherries flavored coffee is perfect served steaming hot or icy cold. Packaged in a heat-sealed valve bag, this decadent and rich white chocolate and cherry-infused coffee will be fresh and full of aroma � ideal for an after-dinner White Chocolate Covered Cherry treat.